More and more parents have the stem cells extracted from the umbilical cord blood stored for their child. These stem cells can be harvested only at birth easily and without pain and stored in a stem cell deposit for decades. Place your order now and select one of the VitaPlus product variants. Choose VitaPlus50 to ensure that your child has access to its own young stem cells for 50 years and secure attractive conditions for the storage as of year 51. Flexibly tailored to your needs! The careful recording and analysis of the medical family history is required by the health authorities and has the purpose of protecting your child in case the umbilical cord blood is applied. Our doctors evaluate by means of the medical history form and the findings recorded on the maternity card, whether umbilical cord blood can be collected and applied later from the medical point of view. The maternity clinic you choose will be informed accordingly. In time prior to the delivery, we will send you the temperature-protected Vita 34 transport box containing the specifically developed collection kit, which includes the required materials to collect the blood. The Vita 34 transport box including temperature-stabilizing gel pads, isolating polystyrene box, and temperature chip optimally ensures the blood’s quality. We trained doctors and midwifes at almost all maternity clinics in Germany and we pay them for the collection afterwards. Immediately after the umbilical cord was cut, the blood from the umbilical cord is collected and transported by a specialized courier to our stem cell laboratory. Storage is possible 24/7, 365 days a year. At the laboratory, the umbilical cord blood is processed and prepared in line with international standards and becomes first-class source material for possible application. The blood is frozen in at least six portions (one main bag, five retain samples). If the blood volume is very high, several bags are frozen at no extra charge. Then you will be sent the certificate of successful storage. Permanent storage is effected in grid-independent cryo-tanks at approximately minus 180 degrees Celsius in special freezing bags packed in a cassette. Each contract is open-end, so that your deposit can be stored for an unlimited period. Your stem cell deposit is insured by HDI Global SE, which will provide the financial funds in case of insolvency in order to continue the professional and controlled storage of your child’s stem cell preparations until age 50. This form of insurance is unique! Vita 34 will send you the test results and is available at any time if you have questions. If the stem cells are applied within the bounds of cancer therapy during the first twenty years of life of your child, Vita 34 will pay you one-time 7,000 Euro. Before the cord blood stem cells are applied within the family, Vita 34 bears the costs of the necessary tests (HLA typing). If the stem cells of your child are applied, you will be supported comprehensively. Vita 34 helps you filling out the forms and talking to doctors. 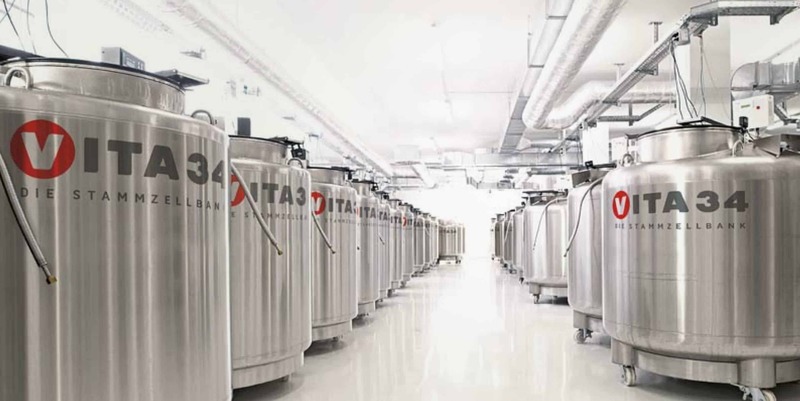 The mobile stem cell team of Vita 34 transports the cryo-preserved stem cells in a special container to the doctor/other user (at no extra charge in Germany) and takes care of the professional preparation of the stem cells. If you set up a stem cell deposit for another child within five years, Vita 34 guarantees the same price as for the first storage and unchanged performance – irrespective of possible price adjustments in the meantime. The price for the second stem cell deposit is reduced by 150 Euro, for the third storage by 300 Euro, and for the fourth storage by 450 Euro. As of the fifth storage, the deposit is exempt from charges except for the annual fee. For twins, the contract fee for the second child amounts to only 50 percent, it does not apply at all for the third and any further child in case of multiple births. By paying the annual fee in advance for the first 50 years, you can save 1295 Euro compared to the annual mode of payment. In collaboration with our experienced longtime partner TEBA-Kreditbank, we offer individual financing options tailored to your personal situation. Call the customer service (00800 034 00 000) or continue reading to get information here. Take private precautions and help others at the same time: Use VitaPlusDonation to combine private storage and public donation! Think of yourself and others. Choose VitaMine&Yours to take individual precautions and help others with a public donation at the same time. * The quantity of umbilical cord blood collected depends on individual influencing factors. Blood volume and cell count may vary considerably. A minimum quantity is required to set up a private deposit and to donate publicly, which can be collected only in a portion of all collections according to our experience. This is finally determined only after the collected blood was tested at the laboratory.